A pretty cool movie with lots of interesting, thought provoking ideas that just never hits it out of the park with any big, memorable moments. Snowden is a good movie that could have been a little better. It’s a movie that definitely has you feel and believe in the paranoia, and understand what this man, Edward Snowden, was going through, learning the truth a little bit at a time, of what his country was really up to. There are a handful of great moments in this movie, from the hike scene debate between Snowden and his girlfriend, to the discussion with a bunch of friends, of how much intel America is collecting on the citizens of its own country. But the movie is definitely lacking in a few key areas. Most notably, it does not show Snowden as ever conflicted in the making of his decision to expose the secrets of his country. Considering the ramifications of such an action, a stronger movie would have found ways to show the conflict of knowing what would come of his taking such an action and deciding to do it anyway. The movie is pretty powerful, but it also has a couple of missteps, (a Nicholas Cage minor subplot, for example,) that would have been better spent in other areas of the story. Snowden is a good, fascinating movie. It’s the true life story of Edward Snowden, a CIA operative who found out things that he didn’t like that the CIA and NSA were doing, and let the world know. Snowden found out that the NSA was spying on American citizens all the time, through the cameras on their computers, their email accounts, and the listening of their private conversations on the phone. He went through multiple stages of being uncomfortable with this information, and those stages developed into anger as he kept learning more. And eventually Snowden reached the point where he just decided that he had enough, and that the American people needed to learn the truth. The movie takes us through all of this. In fact, if anything, what it doesn’t explore enough are the final stages of his decision making. We see plenty of the early stages of Snowden’s career, and the different incarnations of jobs he had with the CIA. We see the moment where he decided, once and for all, not to work there anymore. But there’s a fine line between quitting and being done with it yourself (personally,) and deciding that the whole world needs to know about this, to the point of making top secret information public. That’s the line that we never really see get crossed. We see him do it, but we don’t see him deciding to do it, weighing his options, and considering the consequences. That’s unfortunate, because knowing this story before seeing the movie, it would be understandable to think that watching him make the decision would be one of the best parts. But this movie is more focussed on telling the story of the man, and not as much about telling the story of the single situation. So it takes us through the parts of Snowden’s life that led him to his career. The movie begins with Snowden on a military base. He loves his country and wants to serve it in whatever ways he can. During a routine night time drill, Snowden hops out of bed, hits the floor the wrong way, and breaks his leg. He is issued a military discharge. From there, he is told by the doctor that there are plenty of other ways he can serve his country, and Snowden goes off to look for some of these. This dilemma begins to show itself early on. Snowden goes to work in the field, first being stationed in Sweden. There he works under the guidance of a senior officer, (played by Timothy Olyphant,) and watches as this officer tries to extract some information in a most illegal way. Let’s just say it involves drunk driving. Snowden has a big problem with this and he threatens to expose the officer’s cover, which is a major no no in this industry. He walks away from the Sweden job thinking a little bit worse about his country and what some people who work for the CIA are willing to do just to get what they are after. When he gets back home to the states, Snowden ends up quitting the CIA. But O’Brian brings him back in and offers Snowden a new job. This one is in Hawaii. 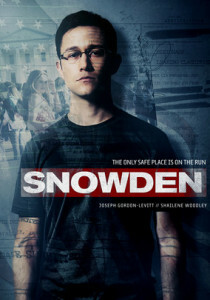 Snowden convinces his girlfriend, Lindsay Mills, (played by Shalene Woolley,) that the job transfer is important. It will be good for his health, (Snowden is prone to seizures,) and plus, he believes that he is the only one alive that can do this job, or that he would trust to do it. It’s kind of funny when you think about it that in the same scene where he is telling her the move will be good for his health, (during a hike,) he has also admitted that he has stopped taking his pills. Still, it’s one of the better conversations in the movie, with Lindsay starts out angry, but ends up convinced that Snowden might be right. And so they move. Things get worse. At one point, after settling into his new job, Snowden comes across some even more disturbing information. He calls some friends together into a small room and shows them a discovery he has made, that the CIA is collecting more data from America than it is from any other country. The guys in this room have all been told that what they are doing as a job is for the sake of national security and threats from other countries, but in actuality, the CIA is spying mostly on us. And regarding what they are actually doing to other countries, it isn’t what Snowden thought. It isn’t spying, it’s setting things up. Apparently America was putting tons of malware into the infrastructure systems of other countries that were are our allies, just in case these countries ever decided to cross us. And these weren’t the big, threatening countries, like Russia, but more of the small, friendly countries like Austria. The discoveries that Snowden makes are great. What’s not great is all the time that is wasted on pointless scenes.Nicolas Cage, for example, pops up for a few scenes as a sort of mentor figure, and all we get from it is that Cage’s character, too, once tried crossing the CIA after being unhappy about some things he found out. The result is that he got demoted and restricted to working alone in a small room for the rest of his career. In another movie, maybe that could be interesting, but here, there is such a juicy story to get to that the Nicholas Cage subplot really just holds things up. There is definitely a good story here and some pretty powerful moments, but they are mostly pretty quick. This movie had tons of moral doubting and standing up for what Snowden considered just wasn’t right. What it was missing was any consideration of the other side. Not the consideration that maybe it was okay to spy on American citizens, but at least the consideration of what the consequences would be for selling out the secrets of his country. It would have been nice to spend more time in and around those consequences, like to see the moment when Snowden learned his passport was revoked while he was in Moscow, and would therefore have to stay there for an indefinite amount of years. Instead, we only hear about this. There’s a lot to like about this movie, including some pretty real paranoia, but there is also a lot of material left on the table, that goes untouched and not explored. The movie could have been better if it had a sharper focus and gave us more of the moments we wanted.